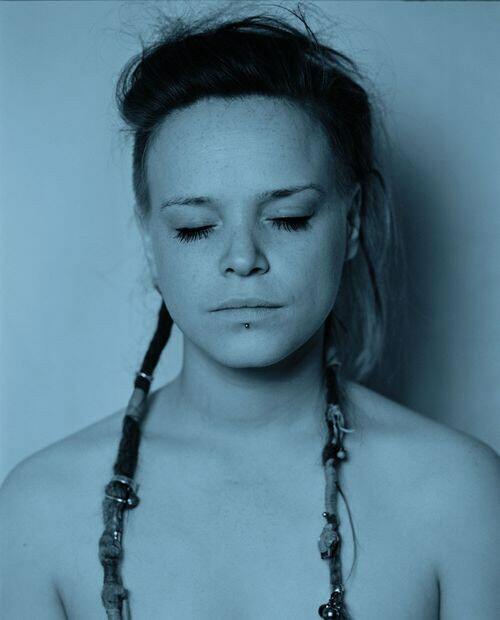 Wallis Bird at The Drake Hotel. 8pm, $15 in advance. This is a 19+ show. TURN BACK TIME: AN 80’s VIDEO DANCE PARTY at Gladstone Hotel. $10 in advance/$15 at the door. This is a 19+ event. 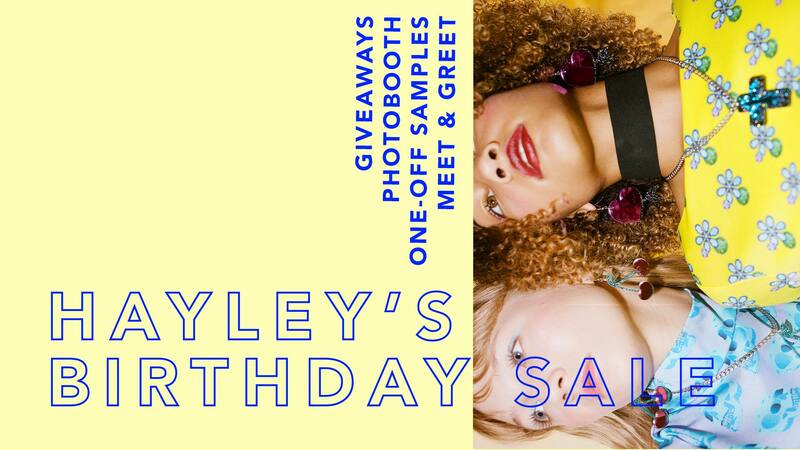 Hayley Elsaesser Birthday Sale! This is an in-store event where you can shop for exclusive discounts and one-off samples. 11am-7pm, located at 695 Queen Street West. 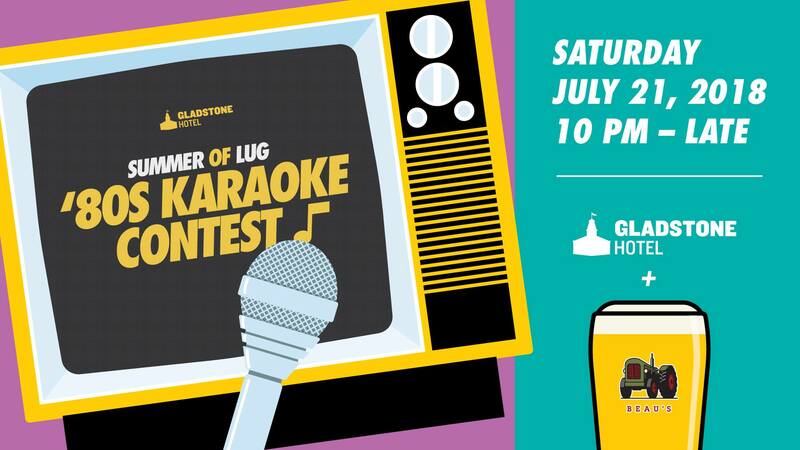 Summer of Lug: 80’s Karaoke Contest at Gladstone Hotel. 10pm-2am, FREE. Zack Mirza “The Art of Deception” at The Drake Hotel, 7pm. $25 in advance. 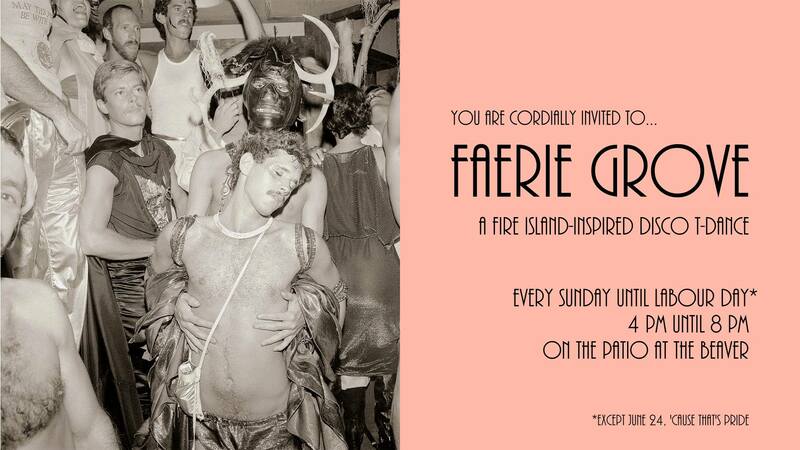 You are cordially invited to Faerie Grove Sunday T-Dance, 4pm at The Beaver. 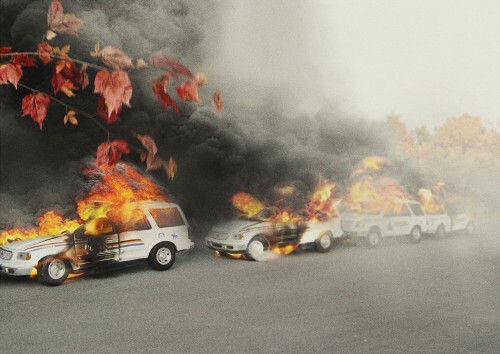 “in medias res” group exhibition at Paul Petro Gallery. On July 13th-August 18th. Tolulope Akanni “Back in Time: A Street Photography Project.” On at The Theatre Centre until August 5th. Where to eat this weekend: make a final reservation with Summerlicious! Harlem Underground, Convenience, Agora, Milagro Cantinas, Oyster Boy, Hooky’s Fish & Chips, The County General, Lisa Marie, El Almacen, The Swan, Banu, Terroni, Rickshaw Bar, Noce, Entice Culinary Lounge, Butter Chicken Roti, Lamesa, The Drake Hotel, Gladstone Hotel, Fresh, Otto’s Bierhalle, Carmen, Bolt Fresh Bar, Frankie’s, The Good Son, Fonda Lola, Nuit Social, Sweet Lulu, Nana, Nunu Ethiopian Restaurant, H Bar, Squirly’s, Smoque N’ Bones, Loaded Pierogi, Juan Gonzalez Taqueria, Montgomery’s, Canis, Death & Taxes, Noce, Dandylion, The Dog & Bear, Barn Restaurant, Church Aperitivo Bar, Ali Baba’s, North Of Brooklyn, King Slice, Baba’s Doner House, Toma Burger Addiction, Kenzo, La Hacienda, Poutini’s, Ravi Soups, Hello 123. Harlem Underground, Milagro Cantinas, Lamesa, The Drake Hotel, El Almacen, Gladstone Hotel, Fresh, Otto’s Bierhalle, Carmen, The County General, Banu, Bolt Fresh Bar, Swan Restaurant, Lisa Marie, Frankie’s, Cafe Neon, The Good Son and Fonda Lola and Death & Taxes, Nunu Ethiopian. Nuna Cafe, Jimmy’s Coffee, Antikka – Cafe & Records, Soufi’s, BUNA, Tokyo Smoke, El Almacen, Sam James Coffee Bar, Cafe Neon, Dufflet, Major Treat, Mabel’s, White Squirrel. 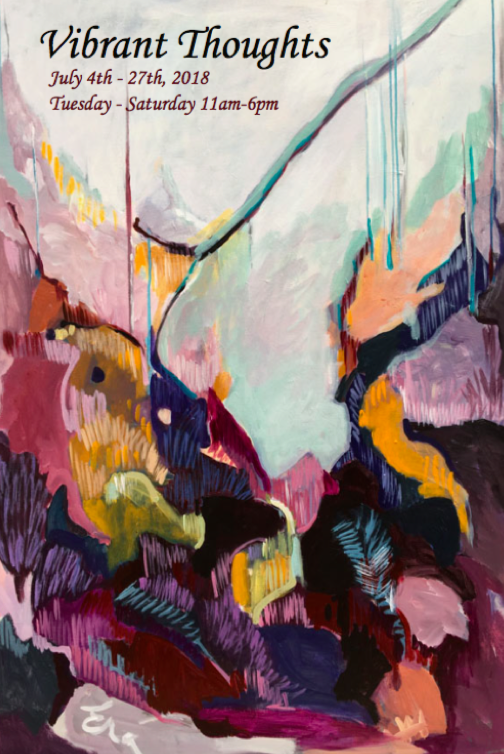 Queen West Art Crawl: Sept 22 – 23, 2018. 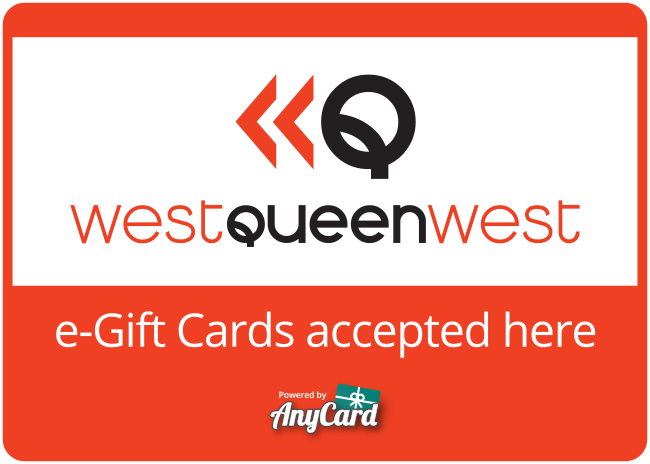 Gift Toronto’s coolest neighbourhood with the West Queen West E-Gift Card! Shops, restaurants, services, salons, spas, art galleries… there are 75+ places from Bathurst to Gladstone where your card can be redeemed! Plus, receive a $25 bonus when you buy a $100 WQW E-Gift Card.